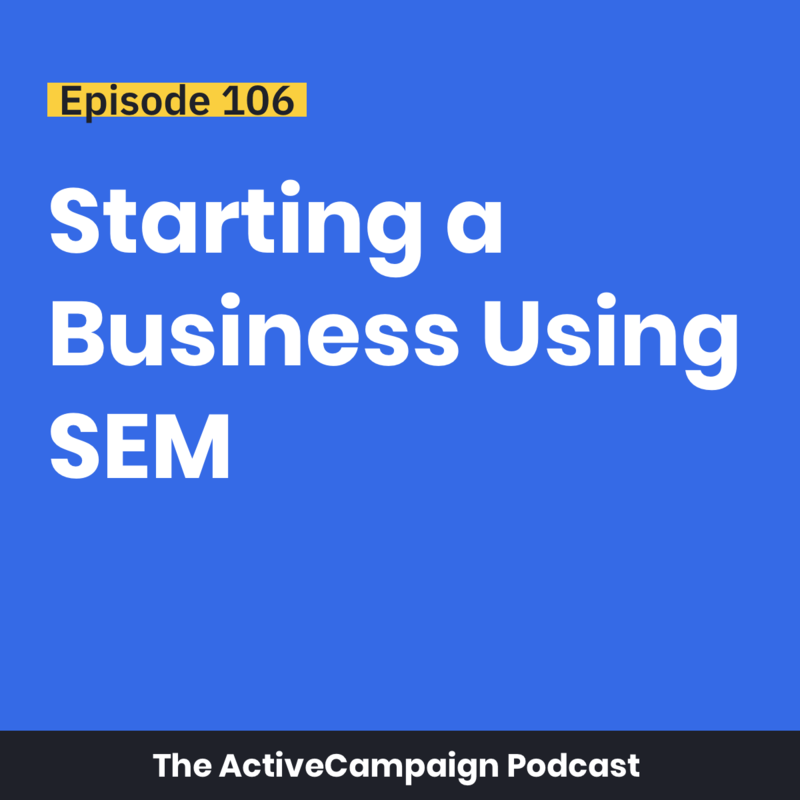 Matthew Nolan of Applied SEM joins the podcast to talk about using Search Engine Marketing (SEM). He details how he used SEM to grow his business while working as a full-time employee which would eventually allow him to transition to full-time entrepreneur. Matt is a Certified ActiveCampaign Consultant and Google Partner. He has been creating SEM campaigns that work for over 4 years for both his clients and his business. Chris Davis: 01:45 Matt, welcome to the podcast. How are you doing? Matthew Nolan: 01:51 I’m doing great. How about yourself? Chris Davis: 01:52 I’m doing good, man. It’s always great to meet new people on the podcast and let you all tell your story, being that you’re a certified consultant. It’s even better because you’re already integrated with the ecosystem, so this just serves as another means, or another layer, of integration I should say. So, give our listeners a quick background on yourself and your business. Matthew Nolan: 02:19 Yeah, definitely. So, I have been doing consulting, marketing consulting, and web design for over five years now, and I started with search engine marketing, hence my business name, Applied SEM. So, that’s really been the core service that I’ve focused on. But since then, it’s been several years and I’ve expanded that into web design and a lot of marketing automation now with ActiveCampaign. So, yeah, there’s a wide range of things that I’ll do in terms of different projects, but definitely lead gen through search engines is something I focus on. Yeah. Chris Davis: 03:11 So, was it … Tell me this. You’ve got the web development experience and then the search engine marketing. When you were building out websites, was that your gateway into the search engine marketing piece or was there something else that drove you to that? Matthew Nolan: 03:31 It’s a good question. It actually was not. I started with search engine marketing. So, I read this book, which really was the starting point of my entrepreneurship, The 4-Hour Work Week, Tim Ferriss. Matthew Nolan: 03:54 Huge fan of Tim Ferriss in general. So, yeah, I read that book, and he talked a lot about Google Ads, and to me, that was something that caught my eye, and I was like, “There sounds like there’s something there.” So, at that point, I started learning and I actually got the certification at the time. I think it was, like, $100, might’ve been $50. Now, I think it’s free. But that’s where I started, and I actually had zero web design skills prior to that, so it was really interesting, I guess, in one way. But that’s how I started. And then once I got familiar with the SEM, it just … Naturally, I started to do a lot of the designing stuff as well. Chris Davis: 05:20 … and just clickety-clack away on the keyboard? What was your day job and what was that moonlighting experience like? Matthew Nolan: 05:28 Yeah, absolutely. So, I started to segue into it my … The job that I was working when I first started doing the moonlighting, doing this, which evolved, but it was actually … I was working for a marketing agency, based out of Philadelphia, and that was … Actually, to back track real quick and clarify, the certification that I got and, really, my first exposure to this stuff was right after college, and I got the certification, which then opened up doors in terms of I got my first “real job” at an agency, and that was a really great experience. I was there for over a year and I learned a lot. It was also … I think it primed me to take a more entrepreneurial avenue because it was a 100% remote position. So, it was, I think, pretty conducive to doing that kind of thing. Not sure if that was a decent answer. Chris Davis: 06:47 Yeah. No, that’s interesting because, from the outside looking in, you were able, without … And maybe you were aware of this or not, but you were able to start getting experience and building a muscle that you would later need. Matthew Nolan: 07:06 Exactly. That’s a good way to put it. Chris Davis: 07:09 Right? I see people have the hardest time when what they do after work does not correlate at all to what they do in their day-to-day. Chris Davis: 07:19 So, with those people, it’s a challenge to say, “Okay, there may not be a direct one-to-one,” but what are some other skills that you’re learning? Are you learning leadership, right? Chris Davis: 07:29 Are you learning timeliness and meeting deadlines? All of those things do translate, but if you could use your day job to really help expose you to what life is like, shape your expectations, it does make that transition a bit easier. Matthew Nolan: 07:47 Yeah, I agree. I agree 100%. So, I guess, in one bite, I was fortunate to have that overlapping ’cause I think that you said it well and that it was … I started, basically, building that muscle, started learning the skills and everything, so I agree 100%. Chris Davis: 08:10 Yeah, yeah. I feel like when I’m talking to the younger generation and I’m trying to help them plan their life, it’s really one of the things that we talk about. I know Sasha was on the podcast and she was talking about it, she’s on our people team, and one of the things is how can you plan out your career? If there’s a place that you want to end up, what kind of job can help prepare you for that? Chris Davis: 08:44 That’s okay to have that kind of strategy for your life, so it’s really refreshing, actually, to hear that was a path, whether it was intentional or not, but that was a path that worked for you. The next question, naturally, that comes to mind is how did you do it? Matt, what was that moment where you were saying, “Okay, I think I’m ready,” and describe just some of the emotions that you were going through when you were like, “Okay, this means, though, it’s all on me.” What was that transition process? Matthew Nolan: 10:26 So, right out of college, I actually landed my first moonlighting gig, and it was because … I mentioned that I got that Google certification. My senior year of college, I got that on my own, and then somebody … My dad’s neighbor, actually, he heard that I got that certification and he was looking for somebody that was doing that stuff, and so that became my first client. It was just one client, and I was still job hunting at the time, but then as I progressed into it, I started getting more people reaching out to me, and then I … Once I got three clients … After, I’d say, my third client, I knew that there was a real opportunity in it. I also just started to really enjoy the whole process. It’s a weird thing. You know what I mean? It’s a lot of work and, of course, it’s not all fun, but it’s the challenge in itself is really fun. You know what I mean? Probably sound a little ridiculous, but yeah. Matthew Nolan: 12:16 Oh, yeah. Definitely. Chris Davis: 12:17 … because you can feel that. So, when you say it made you happy and it was exciting, the challenge, to me, that’s what I hear. Chris Davis: 12:26 So, it’s like how can I create a profession around it? Matthew Nolan: 12:29 Exactly. I won’t go off on too much of a tangent here, but yeah, I’m a big believer in both things. You have to enjoy what you’re doing. I do firmly believe that. Obviously, it can’t all be fun and games, but that doesn’t mean that you can’t enjoy it. And then also, I’ve found that there’s … It’s fair to say you can have more than one passion. You can have more than one thing that you enjoy. Really, my first passion, without question, was music, and I think … I was mentioning to you a little earlier … We were talking about the recording stuff. So, that’s still a very strong passion to me is music. There’s definitely overlap with what I’m doing as far as marketing goes, but I’ve come to really, really enjoy learning technology, and really, it has become a passion. I really do enjoy it. Also, just the whole concept of entrepreneur ship, I kinda … Not to sounds cliché, but I fell in love with the idea, and I really latched onto it. Yeah, I’m a big believer in passion. I just think that you can have more than one and you’re gonna have to work hard. Yeah. Chris Davis: 14:23 … can you just talk about the two and how they differ? Matthew Nolan: 14:27 Absolutely. So, SEM stands for Search Engine Marketing, and it’s very … You’ll hear that a lot, also, with SEO, which is Search Engine Optimization. The primary difference is with Search Engine Marketing … And I just wanna point out real quick, I do both, but obviously, Search Engine Marketing is one of my core services. And so the difference being … The primary difference being that Search Engine Marketing is pay-per-click. So, when you are on Google or Bing and you wanna show up for something, whatever it is … Let’s say that you’re a mortgage lender and you wanna show up at the top of the first page of Google for that, with Search Engine Marketing, there’s not nearly as many smoke and mirrors as there is with SEO, which is the organic … I know I’m not really using layman’s terms here, but basically, Search Engine Marketing is paid advertising and you can get results quicker and you have more control over things whereas SEO, Search Engine Optimization, is organic and meaning not paid, and they both have their pros and cons, but SEO just generally takes a lot longer and it’s a lot more tricky in terms of getting the results that you want whereas with Search Engine Marketing, there’s more formulas that are known, if that makes sense. Chris Davis: 16:26 … right? Matthew Nolan: 16:27 Yeah, exactly. Chris Davis: 16:27 SEM, you can go straight to the top. Chris Davis: 16:31 I’m gonna pay some dollars to be above number one. Matthew Nolan: 16:34 Yeah. So, I also … So, this past summer … I’ve been doing Search Engine Marketing in an agency setting and then also for all my clients, getting results, but I hadn’t done it for my own business up until this past summer. Matthew Nolan: 19:06 … which is why I’m really excited to be on this podcast with you. Chris Davis: 19:10 Yeah, yeah. It’s hats off to you for having that foresight that once the leads started pouring in to think, “Wait a minute. This means nothing if I can’t handle if, if I can’t do something with them.” I tell you, you’re on … If there’s an 80/20, you’re definitely the 20% because most people will err on having something in place, whether it’s an Excel sheet or some form of thing in place for their leads, they just don’t know how to get leads. Matthew Nolan: 19:53 Right. Exactly. Chris Davis: 19:54 I love it because … Matt, here’s the thing that I want more business owners to understand is that what you did is really a blueprint, right? When you’re getting started in your business, especially … Excuse me … especially those early phases, every business needs that jumpstart, right? Chris Davis: 20:18 Some business start by taking … Clients … If you were working at your job and some of those clients transfer. Chris Davis: 20:26 Right? Some people start their business that way where they’re starting off with some revenue already coming in, but most businesses, especially now with technology allowing you to build a business pretty much around any idea and reach your audience directly and everything, you’re gonna need that injection of leads. People very rarely have their messaging tight enough or a budget to do it, but if you did, or when you do I should say, it serves as a very instrumental and required piece to get your business, not only off the ground, but keep it off the ground. Matthew Nolan: 21:07 Yeah, exactly. Chris Davis: 21:07 So, in your experience, what I’m curious on is … ‘Cause I’ve heard many thoughts around this … And Facebook ads is all the rage now, which they do work. I’m not against Facebook ads. I just think that in the day of Facebook ads for everything, a lot of other stuff gets overlooked, and a lot of times when people are talking about SEM or Search Engine Optimization or marketing and they’re specifically talking about Adwords or whatnot, they like to say it’s good for certain businesses. Have you seen that to be true in your experience or can any business expect results from SEM? Matthew Nolan: 21:51 Yeah. That’s a really good question. So, I would say that it definitely does depend. I would say that there are, certainly, more certain industries and types of businesses that will perform better on Google, so that is true, but I would say that it’s the same … that same type of fact applies to any platform. So, for instance, there’s certain types of services and businesses that really would get no value out of Facebook or very minimal value depending on is their audience using? I know Facebook’s definitely dominant in terms of their user base, but for a B to B, for instance, LinkedIn might be much better. Matthew Nolan: 24:29 … if that makes sense. Chris Davis: 24:30 Yeah, it’s … The thing that came to mind while you were talking is Search Engine Marketing is about intention and social media marketing is about attention, right? Matthew Nolan: 24:45 Yeah, exactly. Chris Davis: 24:55 … but on Google or Bing, as you mentioned, it’s very much intentional, like, “Hey, how to fix this broken toe?” Right? Matthew Nolan: 25:04 Yeah, exactly. Chris Davis: 25:04 You wanna see content around that. Matthew Nolan: 25:07 Right. Yeah, there’s no … Yeah, it’s pretty straightforward in terms of … Yeah, you said it best. It’s intent versus the opposite, when you’re disrupting. Matthew Nolan: 25:25 I actually haven’t ran that many Facebook campaigns. I am starting to dabble in that, so I can’t speak on what the conversion rate is and so forth on Facebook, but I know with Google, at least for me and my clients, it works. Chris Davis: 25:43 Yeah. Google is … It’s funny because when I talk to people about lead generation, their mind immediately goes to Facebook. They’re like, “Yeah, I know I should be running Facebook ads,” and I’m just like, “Well, that may not be wrong, but let’s just think it through. What type of business do you have?” X, Y, and Z.
Chris Davis: 26:00 Because a lot of times … Now, just imagine this. Before Facebook, there was Google, right? Matthew Nolan: 26:08 Right. Yeah. Chris Davis: 26:10 Google has more data than … I know it seems, especially depending on when you grew up, when you were born, but Google has been around for quite some time. Matthew Nolan: 26:22 Oh, yeah. I don’t think they’re hurting. Chris Davis: 26:26 So, are we just gonna skip … We’re gonna jump over the elephant to get to the mouse? Well, I shouldn’t call Facebook a mouse. Maybe a goat or some animal smaller than an elephant. Chris Davis: 26:38 Let’s not ignore, literally, the elephant here. It can help. Chris Davis: 26:45 But I, also, I will tell you this, Matthew, I don’t see a lot of people positioning themselves as able to get results using Google. So, I think it’s … Since Facebook is so … I don’t wanna say cliché, but it’s the hot thing. Chris Davis: 27:22 … but at a bare minimum. Just figure out what works for you. Chris Davis: 27:26 Some of the businesses, all they need is Google. Matthew Nolan: 27:38 … ’cause you can’t … I didn’t wanna be a jack of all trades, master of none kind of thing. Matthew Nolan: 27:46 I don’t know if that’s the right expression, but I think … You know what I mean? Basically, I didn’t wanna try and get great at everything. I wanted to really hone in and, “Okay. What platform do I think I can really get good at?” and so I just chose Google. Chris Davis: 28:05 Absolutely, absolutely. Well, Matt, we’re coming to a close. I have to ask you this question ’cause I’m sure this is on people’s minds now after listening to this, and they’re like, “This sounds good. How do I get started?” Right? Chris Davis: 28:19 So, what would you say would be some steps people can take to get to ensure their business is ready for some SEM? Matthew Nolan: 28:31 Sure. Great question. So, I would recommend … If someone has a real interest in exploring Google as an avenue for lead gen, a really good way to find out if it’s good fit is, obviously, you they can do their own research, Google’s got a ton of resources online, but right now … Excuse me … I am offering one free consultation to anyone that has an interest in really getting tailored solutions and seeing if … So, I would say go to my website if you really wanna get some tailored insight and schedule a free consult. Yeah. I’ll give them some of my time for free and I’ll ask them some questions and we would go from there. Chris Davis: 29:33 Great, great. Now, do they have to be in business for a certain amount of time, do they have to be selling a certain type of product, or is it pretty open? Matthew Nolan: 29:43 I would say it’s definitely pretty open. As far as … I have more experience with service-based businesses, so if they own a service-based business, whether they’re a doctor or they have the practice or they’re a dentist or they own any kind of gym or yoga, anything that’s a local service-based business, I’ve gotten pretty good at building solid strategies around, but I’m also working with an e-commerce online furniture store, and so it’s really pretty open in terms of that. Anybody can reach out to me. At this point, will talk to any type of small business owner that’s looking to get on Google and do it right. Chris Davis: 30:36 Great, great. Well, Matt, thank you so much for jumping on the podcast. For the record, just to make sure I got it ’cause I can’t remember if I asked you, what’s the website? Matthew Nolan: 30:46 Yeah, it’s AppliedSEM.com. That’s the website to go to, and on there, there’s a section right on the homepage actually, and you can schedule a free consult. Chris Davis: 31:00 Great, great. Well, that’ll be linked in the show notes of this episode as well at ActiveCampaign.com/Podcast. Matt, this was a pleasure, man. Thank you so much for coming on and sharing your insight and expertise. Matthew Nolan: 31:15 Likewise. I really appreciate it, Chris. It was great chatting with you. Chris Davis: 31:18 Yes. Thank you so much, and I’ll see you online. Matthew Nolan: 31:21 All right. Have a good one.